Metallica are streaming video of a performance of their 1991 classic, “Enter Sandman”, from a March 9 show at the KFC Yum! Center in Louisville, KY. The track was the lead single of the group’s self-titled record, commonly known as the “Black” album, the band’s first to top the US charts on its way to sales of 16 million in the States and more than 31 million worldwide. 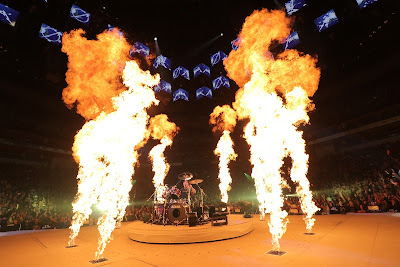 The recent concert marked Metallica’s first show in Louisville in 15 years and only their tenth performance ever in the state. Having just wrapped up the North American arena leg of their WorldWired tour, the band will next be seen alongside Major League Baseball’s San Francisco Giants as they host the 7th annual Metallica Night at AT&T Park on April 26. “Just before we take off for our annual European summer vacation – we'll celebrate one of our favorite hometown traditions, Metallica Night at Oracle Park with the San Francisco Giants,” says the group. “Members of the band will be on hand to start things off with the National Anthem and first pitch, sticking around all night to cheer on the team against the New York Yankees. As is customary, we'll take part in some of the between-inning fun and games, as well as an exclusive pre-game VIP event. Launched in 2017, the band’s non-profit organization is dedicated to creating sustainable communities by supporting workforce education, the fight against hunger, and other critical local services; learn more about the charitable endeavor at allwithinmyhands.org.